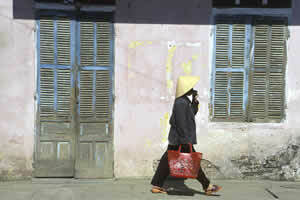 There's an excellent BBC radio show today discussing Vietnam's ascedancy into the world economy. The fourth fastest growing economy in the world. It's a very real and fair representation of where Vietnam is at, with a slightly commical colonial presenter, Peter Day. The Hottest Beta Launch of 2007? It is the hottest Beta on the block right now and could be set to revolutionise our media use and sharing - the venice project. They want to do for TV what skype has done for telephony. It has the potential to become our default media player/tv platform - with built in peer to peer media catalogue from around the world. To understand more a good place to start is a read of the venice project blog. Listen to the interview with Janus Friis, co-founder. An early preview-review from GigaOm..
Well, once in a while there's no harm in a little shameless self-promotion. The Wall St Journal today picked up on the crazy market for newspaper's bidding on Search Engine keywords. I started this for The Times around three years ago, when we were the only real player in the market. And over time the strategy has been honed and improved, with expert help from Sitelynx. The market is becoming saturated now at the top-level, but for those with the experience and understanding of their customers, there's plenty of room newspapers to extend SEM in lower-cost areas of search. LONDON -- Britain's famously competitive newspapers have a new battleground: Google. Newspapers are buying search words on Google Inc. so that links to their Web sites pop up first when people type in a search. The Daily Telegraph, for example, bought the phrase "North Korea Nuclear Test" after the country detonated a nuclear device last October. People in the United Kingdom and the U.S. using English-language Google who typed the phrase into the search engine saw an ad for the Telegraph Web site on the top right of their screen. The ad, which linked readers to a Telegraph article about the test, was labeled a "sponsored link" in small type and shaded blue on some computer screens to distinguish it from Google's own search responses. Many papers are also tailoring their Web sites to attract Google's news site, which has links to thousands of news articles. The Times of London, owned by New York-based News Corp., is training journalists to write in a way that makes their articles more likely to appear among Google's unpaid search results. "You make sure key phrases and topic words are embedded in the top paragraph and headlines," says Zach Leonard, the paper's digital-media publisher. Recent words purchased by British papers related to articles about House Speaker Nancy Pelosi and the poisoning of Russian spy Alexander Litvinenko. The Sun, a News Corp.-owned tabloid known for its daily "page 3 girl," a photo of a scantily clad woman, recently bought an ad linked to the search term "George Bush." When people searched for the name, responses included links to the official White House Web site and an ad linked to a Sun Web page with articles about the U.S. president. Some U.S. newspapers such as the New York Times, the Washington Post and Gannett Co.'s USA Today say they sometimes buy search terms on Google. At The Wall Street Journal, published by Dow Jones & Co., Gail Griffin, general manager of The Wall Street Journal Online, says, "It's something that we have tried in the past but it's not a big focus for us." But the British press is more frequent: The Times of London often buys 10 words a week. The Telegraph, a property of Telegraph Group Ltd., hired consultants to boost its Google News appearances. 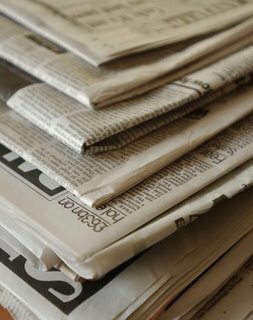 Their recommendations included: keeping headlines on the main Telegraph Web page and other pages identical so as not to confuse Google's computers, which, rather than human editors, select stories to highlight. It's an effort to fight for online readers at home -- and attract readers in the U.S., who are frequent visitors to newspaper sites in the U.K. The Guardian, owned by Guardian Media Group PLC, says five million of its 13.8 million online readers live in the U.S. The Times says it has about three million readers in the U.S. And about one-third, or two million, of the Telegraph's online readers are in the U.S. The papers say U.S. readers help them attract advertisers, including international luxury brands and British travel companies. "The most important driver of all readers [to our site] is Google, except for people who know us and come directly," says Edward Roussel, the Telegraph's digital editor. "It plays a critical part of exporting our brand, particularly to the U.S." Trying to figure out how to gain more prominence is "something of a dark art," he adds. Online is the latest front in the decades' war among British papers and is, in many ways, an extension of how old media are looking to adapt to the Internet. The British press has battled to win readers with screaming headlines, lower prices, coupons, game promotions and, recently, by giving away free CDs and DVDs with their papers. Paying to put their stories in front of readers by buying Google ads -- a practice the papers say has intensified in recent months -- is different from past marketing efforts, they say. Some readers may not realize that links to articles that appear higher up on Google are paid for while others appear lower down because they didn't pay, even though the higher ones are marked "sponsored links." A spokesman for Google, which is based in Mountain View, Calif., says he doesn't think the use of ads to direct people to articles is confusing. "Our sponsored links are very clearly marked and our feedback from users is that they find the ads useful because they relate directly to what they are searching for," says spokesman D.J. Collins. To buy search terms, papers pay Google at least 19 cents each time the term is clicked on. Prices can go up to $2, or even higher, depending on demand from other advertisers. Google sells the terms through an auction. The papers can stop using a word or phrase any time. Some change the words daily. The British papers have been buying terms on both Google's U.S. and U.K. sites. The papers have also bought ads on other search Web pages but say they mostly buy on Google because it is the most popular search site in the U.S. and Britain. At times, the papers try to outbid each other for terms. Over the summer, both the Times and Telegraph bid on Google many times for rights to the word "Ashes" -- the shorthand name of an annual cricket tournament between England and Australia. Other bidders included advertisers for the sporting event. On some days the Times paid more, making its ad appear above the Telegraph's. The Telegraph also bought misspellings of the word, including "Ahses." "It's a lot of effort to go through" to get new readers, says Steve Leach, chief executive of Big Mouth Media Ltd., a Scottish consulting firm that helps companies improve search-engine results. "You need a lot of research to determine which headlines to use. Then you have to upload them to search engines and decide how much you are going to spend. It's labor intensive." Isn't it hi-time we did things differently on screen. There's no real use of sound, most websites are flat and rely on single mouse clicks to do everything. Being 'online' there are of course a bunch of smart people working on a facelift for the web. With Microsoft's Vista and Sun's Beta project Looking Glass, the UI experts should be in a lot of demand over the next years. Have a play with Looking Glass, it's crude but opens your mind to how we will be interacting with the screen in 3D. Nice graphics are one thing, but using them in practical, useful or entertaining applications is what I would dip into my pocket for. Car, House buying in 3D - I'd like to keep a folder of prospective houses on my Harddrive, perhaps my contacts linked in 3D, so that I can see relationships between them, Graphs and charts should hugely benefit (Excel isn't too good at 3 or more axes). These desktop initiatives should influence webdesign over the next year, just as XP brought shading and drop shadows back, we should see more 3D designs on the web. This should bring new application to social media, news and shopping. Just as Wolfenstein 3D and Doom defined a revolution in gaming, these could be the seeds of something similar for digital media.